According to his online biography Christopher Somerville is responsible for thirty six books on travel and walking so it’s fair to say he knows his words as well as his walking. 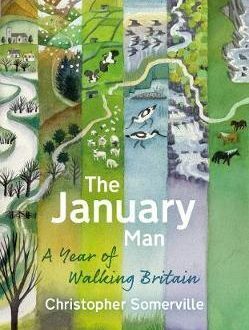 In this delightful book he explores the calendar year through a series of walks and rural experiences across the length and breadth of Britain whilst also trying to get to grips with the ghost of his erstwhile walking companion, his father. I am of the age now where a book that hints at nostalgia for rural eras past touches me, as long as that nostalgia isn’t overly saccharine or a pretext for “Wasn’t life better in the good old days”, it’s a fine line to tread but Somerville does it extremely well. 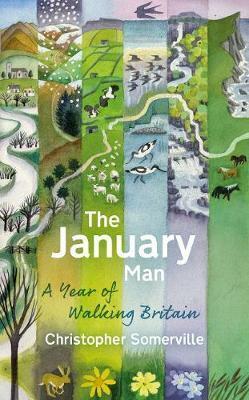 Each month is preceded by a quote from the folk song that furnished the book with it’s title, “The January Man” written by Dave Goulder, a song that smacks of an age old folk staple but was in fact written in the sixties, and it works, as the evocation of the seasons is one of the author’s strongest suits. His observational eye for the flora and fauna of the British countryside is sharper than he gives himself credit for and he is knowledgeable in the kind of way that makes you think “We could do with him in our pub quiz team” rather than the “Oh, please do shut up!” manner of some naturalists. As well as natural history, the history of place is ever present, whether it is in the archaic rituals and rivalries of the Morris Men of Somerset and Wiltshire, or, my favourite, the remarkable tale of the survival of the Reverend Donald Carr during a blizzard on Long Mynd. But, it is the shadow of his father that is ever present in the book. John Somerville was a senior civil servant at GCHQ during the Cold War and a notable Naval Officer and it’s Somerville’s exploration of the bond they shared, made difficult by his father’s private and taciturn nature, when they were walking that really lifts this book to another level. Whether it is tramping in Langdale in blister inducing, unsuitable boots, ploughing through the thick fog on The Pennine Way or exploring the ruins of ancient civilisations under the continental sun, the reflective passages are the strongest in the book and the obvious bond of affection comes through. Maybe it’s because I now feel I am at that age where the issues raised in the book affect me. Much of my love of the outdoors can be traced (amongst other things) back to my upbringing and walks I took with my father. My Dad was never a walker per se, he was an ornithologist or an angler and the walk was the mechanism by which these adventures were facilitated. However, I remember walking miles to windswept hides at Rye Harbour to gaze across the gravel scrapes fortified only by a thermos of coffee and a cheese and Branston Pickle sandwich or climbing the bare, barren, white scree slopes of Pyrenean foothills looking for Eagles or Vultures or winding our way through woodland and over the “one plank bridge” to find our favoured fishing spot at Farthing’s Lake always hopeful to see a Kingfisher flash across the water or a Grass Snake swimming through the sedge. I am lucky, my Dad is still around for walks, albeit of a gentler nature now but still involving a telescope, flask of coffee and more often than not, a country pub. When I walk, I am freed from the depressing grind of urban life, from social media, from Brexit and Donald Trump and all the things that seem to matter in the moment but, in fact, don’t. I think the reason this book appealed to me so much is because that is how the author seems to feel to. He revels in the simple pleasures, a pint of scrumpy, a burst of folk music, Fieldfares eating windfall apples, a rural church or Pink Footed Geese grazing the stubble in a Beet field. I can’t recommend this book enough. Nature writing is in vogue at the moment and there is a plethora of it out there, much of it excellent, but this book touched a chord with me with the warmth of it’s writing and the keen eye for the details of a life that was once more familiar to me. I can’t wait to get out and do some more exploring as soon as this damn knee allows it!